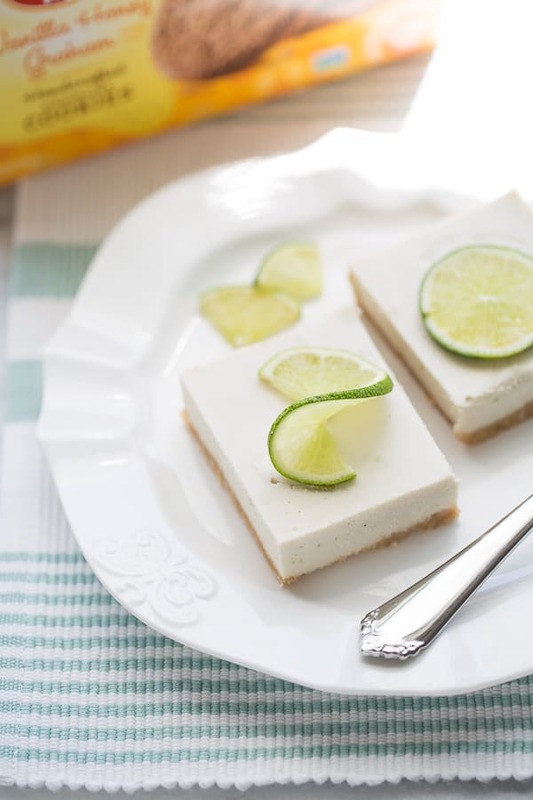 Creamy, tart vegan key lime pie bars with a tasty graham cracker macadamia nut crust. 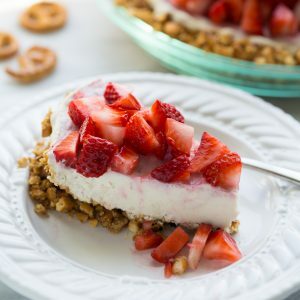 An easy, make-ahead summer dessert! This post was created in partnership with Enjoy Life Foods. May is celiac disease awareness month and this year will mark my 5th year eating gluten-free. I was diagnosed with celiac disease in 2012 after my oldest son was born. Pregnancy was the trigger for my celiac disease onset, but it took my doctors awhile to figure out what was going on. I had so many unexplained symptoms and just felt like something was “off” for months until I was diagnosed. When my son was 18 months old, I had a skin biopsy come back positive for dermatitis herpetiformis and the follow-up bloodwork confirmed celiac disease. I was actually happy to have a real reason to explain why I was feeling so unwell! It can be hard to transition to a gluten-free diet, but is so worth it to experience better health. After 5 years, eating gluten-free feels totally natural. I also eat mostly dairy-free and have found ways to recreate my favorite dishes. 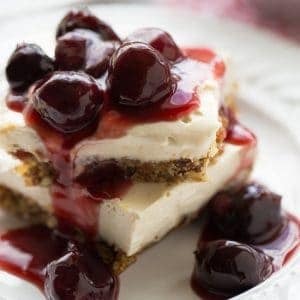 Awhile ago I was skeptical about creamy vegan desserts until this No-Bake Vegan Cherry Cheesecake changed my world. Dairy-free cheesecake is totally delicious in it’s own right! 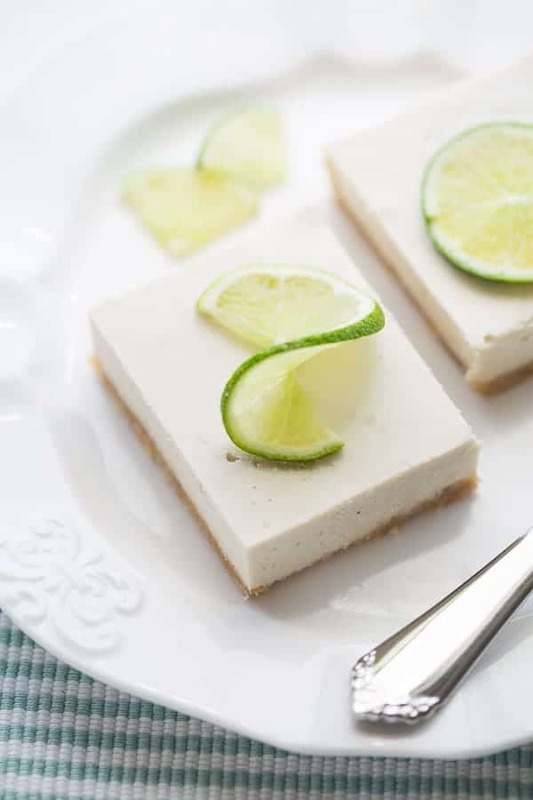 These key lime pie bars are similar to vegan cheesecake in that they get their creaminess from cashews and coconut milk. They are also so easy to make and set up in the freezer which is perfect for summer. 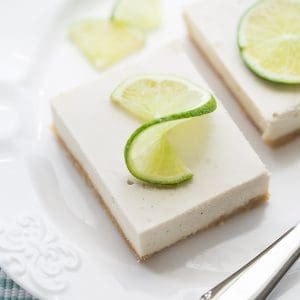 I love that these Vegan Key Lime Pie Bars keep in the freezer for up to a week so they are a great make-ahead option. I’m so grateful for brands like Enjoy Life Foods that make gluten-free life so much easier! As many of you know food allergies and intolerances tend to come in pairs. I have a dairy intolerance along with celiac. All of Enjoy Life Foods products are Top-8-Free! This means they are free of dairy, gluten, nuts, soy and more. 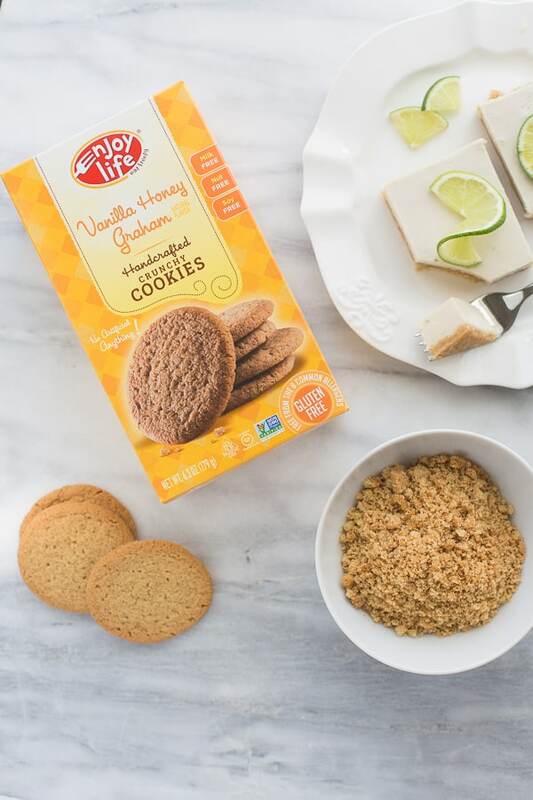 These Vanilla Honey Grahams are not only tasty to snack on, but make a great graham cracker crust for these Vegan Key Lime Pie Bars. Make these bars as a dessert for any upcoming summer parties! 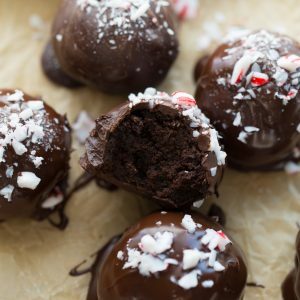 They are so creamy and delicious, they’re sure to be a crowd-pleaser even if your friends don’t have food allergies! 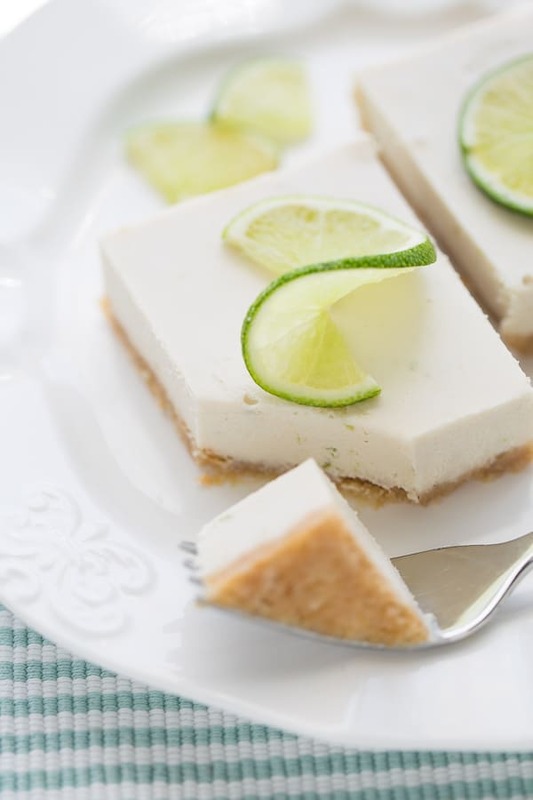 These Vegan Key Lime Pie Bars from Texanerin also look delicious. Also check out these cute individual Gluten-Free Lemon Sour Cream Souffle Cakes from Fearless Dining. Creamy, tart vegan key lime pie bars with a tasty graham cracker macadamia nut crust. An easy, make-ahead summer dessert!These bars require soaking cashews ahead of time so plan accordingly! The bars will keep in the freezer for up to a week so they are a great make-ahead dessert! Soak the cashews: Place the cashews in a bowl and cover with water. Let sit at room temperature for 2-6 hours or in the refrigerator overnight. Drain before using. For the crust: Place the graham crackers in the bowl of a food processor. Pulse until they form a fine sand. Pour the graham cracker crumbs into a bowl. Place the macadamia nuts in the now empty food processor. Pulse until they form a fine meal. Add to the bowl with the graham cracker crumbs along with the melted vegan butter and stir to evenly combine. Lightly grease an 8x8 inch baking pan with cooking spray. Press the crust mixture into the pan into an even layer. Freeze for 15 minutes until set before topping with the filling. For the filling: Place all the ingredients, except the lime zest, into a high-speed blender. Blend until completely smooth. Add the lime zest and pulse to combine. Pour the mixture on top of the crust. Place the bars in the freezer for 2-4 hours until set. Bars will keep in the freezer for up to a week. Slice while frozen and let come to room temperature for 20 minutes or refrigerator temperature for a couple hours before serving. Enjoy! *If your coconut milk is solidified, pour it all out into a bowl and heat for a few seconds in the microwave, then whisk until smooth and measure. You want an even mixture of the solid fat part and liquid part for this recipe. Thank you very much for the time and thoughtfulness you put into this post. I love Key Lime pie but the last few years have been very unfriendly to me with regards to dairy. I have a few questions I am hoping you can help me with as some of your ingredients list I cannot have. I have just recently started researching a modified Vegan diet and have been trying to look for substitutes in some areas. So here goes, what is a good replacement for the coconut milk and oil? Could I use say avocado oil for the oil and maybe almond milk for the coconut? What is a good substitute for the cashews and macadamia nuts? Could I substitute almonds or pecans or walnuts? Hi Joe – good luck with your new diet! The coconut milk and oil are needed in this recipe for the correct texture. Coconut oil is a solid when it’s chilled so it helps these bars set up. Coconut milk also has a higher fat content than almond milk so almond milk won’t work here. Sorry about that! Make ahead desserts like these yummy bars are PERFECT for parties. I made these and froze them for my baby shower and they still turned out perfect.